Aesthetic dentistry encompasses many possible types of treatment. This can range in complexity from simple tooth whitening to full mouth reconstruction. 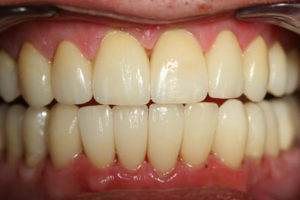 Damage to natural teeth can require veneers to correct wearing or irregularities. This dysfunction can often be attributed to the muscles of the head and neck. If this is the case, the same dysfunction will be working against the long-term stability of the veneers. We use the principles of neuromuscular dentistry to discover how the muscles are controlling the jaw. This information is used to determine the correct jaw position prior to placement of the veneers in order to protect them from damage and to ensure the natural teeth from additional damage. In major reconstruction, the natural teeth are prepared and “caps” or crowns are placed on what is left of the natural tooth. When most or all teeth are damaged, the dentist may recommend this treatment to remedy pain or dysfunction. It is also an option often considered in aesthetic dentistry. Instead of trying to preserve a habitual bite that may or may not be correct, the neuromuscular dentist will first establish an ideal jaw position and then place the reconstructed teeth in a position that maintains the healthy balanced jaw position.